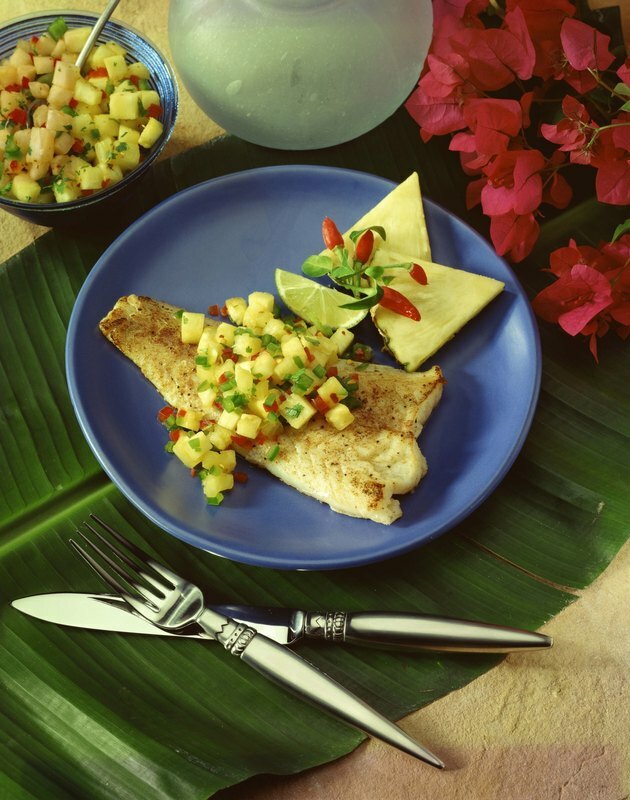 Fish is a healthy, low-fat source of protein that contains essential omega-3 fatty acids. Adding omega-3 fatty acids to your diet can help lower your blood cholesterol and reduce your risk of cardiovascular disease. The Dietary Guidelines for Americans recommends you eat at least 8 oz. of seafood each week, especially fatty fish like salmon, to get a healthy dose of omega-3 fatty acids. Baking is an easy and healthy way to cook a fish without adding high amounts of other fats to the dish. Coat a glass baking dish with 1 tbsp. of butter or oil. Mix together 1 tbsp. of parsley, 1 tbsp. of lemon juice, 1 tbsp. of olive oil and salt and pepper to taste, in a bowl. Rinse and pat dry the fish fillet. Place the fish in the baking the dish and coat the fillet with the seasoning mixture. Sprinkle both sides with additional salt and pepper. Bake the dish for about 10 minutes for a 1-½-inch-thick fish fillet, or until the fish has an opaque center and a meat thermometer reads 145 F when inserted into the thickest part of the fish. The cooking time depends on the thickness and size of your fish fillet. Transfer the fish to a serving platter. Garnish with fresh-ground pepper, chopped parsley and lemon wedges. Preheat the oven to 450 F. Lightly oil a glass baking dish with 1 tbsp. of butter or olive oil. Cut one lemon into thin, round slices. Place four to five slices on the bottom of the baking dish. Rinse the fish fillet and pat it dry with paper towels. Sprinkle both sides of the fillet with salt and pepper. Place the fish onto the baking dish on top of the lemon slices. Place the rest of the lemon slices on top of the fish. Drizzle the fish with olive oil and, optionally, sprinkle it with dried herbs, such as parsley, thyme or dill. Bake the fish for about 10 minutes for a 1-½-inch-thick fish fillet or until the fish has an opaque center and a meat thermometer reads 145 F when inserted into the thickest part of the fish. The cooking time depends on the thickness and size of your fish fillet. Remove the lemon slices and serve the fish fillet with lemon wedges.